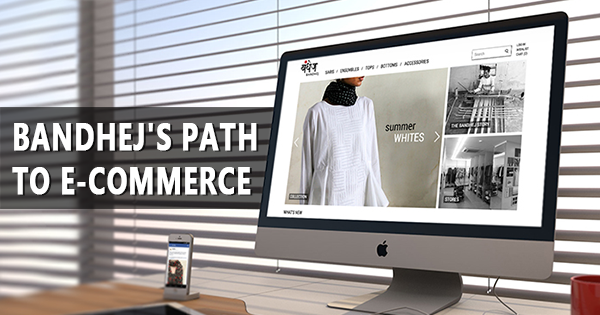 One of the most iconic brands in women’s ethnic and contemporary wear in India, Bandhej recently launched their e-commerce store to the world on 21st April, and here’s the story of how it evolved from a conversation over a cup of great coffee to what it is today. For those who aren’t aware, Bandhej is a brand for women’s apparel started by Archana Shah in 1985 that marries indigenous Indian textiles & craftsmanship to contemporary designs. In the first week of January 2014, I was introduced to Archana Shah, the leading force behind everything that Bandhej stands for, and we scheduled a meeting at their workshop in east Ahmedabad. Archana briefed us on what Bandhej stands for and how it has evolved over the last 3 decades. They were one of the only Ahmedabad boutiques to invest in branding – back when very few had similar foresight. It was clear that they had been looking to expand their presence online but weren’t able to get the right people to lead the charge. Luckily that’s where we came in and collectively decided to start with a social media presence. Instead of spreading ourselves thin on all social media platforms, we decided to go to the most mainstream one – Facebook. And to tell you that the response was fantastic is an understatement! In less than 15 days, we were able to scale up the community to 9k likes. And the beauty was that a lot of them were organic likes. People were actively liking, sharing, commenting and engaging with us and the products of Bandhej. There was clearly an audience on Facebook waiting for this brand to emerge online and they were really happy to be here. Soon enough, people started asking for them an avenue to shop online. With such high levels of engagement and legitimate looking inquiries not just from different parts of the country, but also from abroad, made the need for an e-commerce store very clear. After the decision was taken, we got right to work with figuring out the best possible way to match the brand’s impeccable standards of quality. We also wanted to make sure that the design & brand ethos translated to the online store. We started running through mood boards and user journeys for the kind of customers that Bandhej gets and merged that with insights from the profiles of people that were engaging with the brand on the Facebook page. After this, we got to the drawing board (proverbial; we just went to our design laptops) and got into the key user interactions to make they are designed the right way. So what got Bandhej’s online store to a great start? Built a great community on Facebook that had an audience that loved their products. It led to orders right on the very first day of launch without spending a single dime on spreading the word. High-quality products; emphasis on quality of images, catalog go a long way in making sure that the site looks the part and leads to conversions. And the most exciting part? It’s just getting started on its journey as an e-commerce player. Excited to see what’s up ahead. Stick around and we’ll keep you posted. If you have any specific questions regarding decisions we made – technical/platform/business let me know in the comments below or tweet them to me @abhikb and I’d be happy to answer whatever I can!